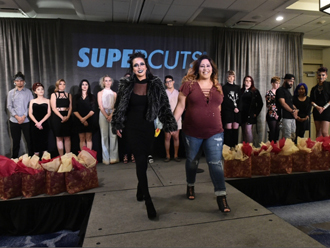 Salon Success Academy Riverside Campus Director, Brandy Edwards, was presented with the Ultimate Teacher Award at the Supercuts SUPERSUNDAY event held in Los Angeles last month. Teachers were recognized for the difference they make in students’ lives, and Edwards was nominated by Marcella Castellanos with a heartfelt nomination letter at the award ceremony. Our students also had a great showing. Out of the 200 Rockin’ the Runway competitors, only 10 are chosen as finalists. Nine Salon Success Academy students entered and two made it in the top ten! Cosmetology students, Angel and Amber, placed in the top ten of the trendsetter category. Stylists were required to create their own look that’s “runway worthy.” They could choose to enter in one of the style categories such as Super Pixies, Power Braids, or Wrapped Ponytails. Or, they could even invent their own signature fall inspired design. Since Angel and Amber were top ten finalists, they got to show off their designs at the Rockin’ the Runway Hair Awards Gala Dinner and Reception on October 30, 2016 at the Newport Beach Resort Hotel. Angel Acosta, who used her daughter as her model, came in third place for professional hair trimmer. Amber Lerma, who used fellow student, Bitali Noriega as her model, came in fifth place for professional styling tool. Want to learn more about Salon Success Academy, local events, or how you can join our community? Call 877-987-4247 (HAIR) today!